Indoor umbrella holders (also known as umbrella racks and umbrella stands) found for sale in consumer stores and websites on the consumer products market may be attractive but not functional or durable enough for commercial purposes. They usually do not have a large enough capacity nor can they withstand the constant, heavy use. Commercial umbrella racks are made of a durable all aluminum construction designed for high volume and long term use. They also tend to have a larger capacity. Some Glaro Inc. umbrella racks even have a removable drip tray, an important feature. Building visitors use various models for full size and tote style umbrellas. For many commercial locations an indoor umbrella holder needs to be able to accommodate a variety of sizes. Many commercial umbrella holders provide this function, such as product lines by Glaro Inc. You most likely will not find these at retailers geared for the consumer market. Commercial umbrella holders are often available in high end finishes not seen on retail products. 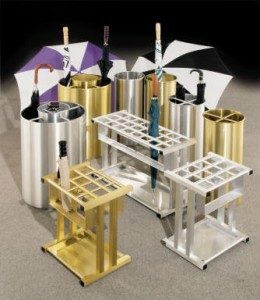 A leading manufacturer of umbrella holders will offer high quality metal and powder coated finishes with lustrous sheens that are easy to clean and will not rust or tarnish. Commercial size indoor umbrella stands normally come in a larger capacity than residential stands. This allows a building to confidently accommodate fluctuations in visitor traffic, even in heavy, protracted rain periods. Commercial racks can match one another and they can be coordinated with other products in a building’s lobby and beyond. For example, all product lines from Glaro Inc. can have the same finish, whether it is a waste receptacle, sign stand, smoker’s post, umbrella stand, or even crowd control equipment. Creating a unified visual aesthetic will present your business in a more professional manner and make a positive impression on visitors. Every well-equipped professional office, medical office, small retail shop, or place of business can benefit by being prepared with umbrella racks as well as wet umbrella bag stands that help prevent slip and fall injuries. Consider an American manufacturer of commercial umbrella racks for indoor use when doing your research and choose a company that has a strongly established reputation. If you see a Glaro Inc. umbrella rack somewhere, take a photo of it and message us on our Facebook page here below. We would love to feature your photo there.